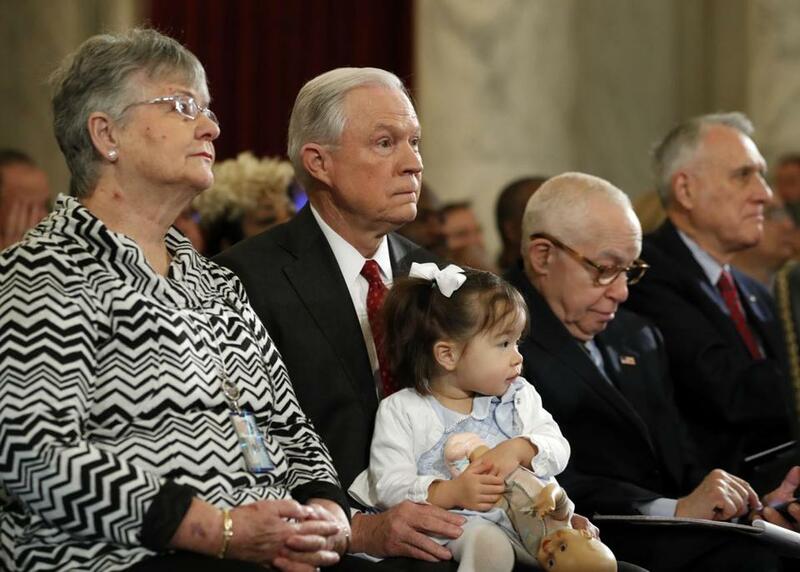 Attorney General-designate, Senator Jeff Sessions, sat with his wife, Mary Sessions, and held a grandchild on his lap on Capitol Hill. Senator Jeff Sessions had some unusual guests at his confirmation hearing on Tuesday: Four of his young grandchildren. As the hearing for President-elect Donald Trump’s pick to lead the Justice Department got underway, Sessions was seated along with his family before answering questions from members of the Senate. As members of the Judiciary Committee spoke, he held one of his young granddaughters while three others sat with his daughter, Ruth, and son-in-law, John. As he opened his remarks, he introduced his granddaughters as Gracie, Hannah, Joanna, and Phoebe. Sessions and his wife have three children and ten grandchildren.